California is the United States' wine country and rightly so. So many good wines come from The Golden State. But in the past few decades many California wine regions are turning into something of a monoculture where one or two cultivars dominate. These "noble" varieties are now what could also be called the international varieties. Cabernet Sauvignon, Chardonnay, Merlot and Pinot Noir. The varieties and styles of yesteryear have been mostly forgotten. However, there are a few producers looking to break the mold of the big, bold, fruit-forward style of California wine. Last week I wrote about love trying interesting cultivars and they can definitely be found in The Golden State. This past week, I opened three such wines from producers of the so-called "New California" wave. It just so happened that all three were made from unusual (for CA) white grape cultivars. My least favorite of the trio was the Carlisle 2014 Grüner Veltliner Steiner Vineyard (14.1% abv, Purchased $24). Perhaps it was because it was the youngest or contained the highest alcohol. Either way it was a nice wine, but definitely has room for improvement. It has medium plus body – heavier than I expected. it is not exceptionally aromatic. The higher alcohol is noticeable on the nose. This is definitely on the richer side of Grüner Veltliner spectrum (if there is such a thing). There are flavors of apple, spice, citrus, just-below-ripe tropical fruit, and atouch lanolin. The alcohol comes through again on the palate, but maybe only because it was a bit warmer than ideal. I like it, but don't love it. It seems to be in a bit of a dumb phase. I am looking forward to see if it blossoms. "A California wine with a spiritual connection to Friuli, Italy, but also drawing inspiration from the great whites of the Loire, Burgundy, Graves, Alsace, the Rhone, old-school Napa" – that's how Jill and Steve Matthiasson describe their Matthiasson 2013 White Wine (12.3% abv, Purchased $34). I don't know if I could say it much better than that. The 2013 blend is roughly 55 percent Sauvignon blanc, 25 percent Ribolla gialla, 15 percent Semillon, and 5 percent Tocai friulano. Sauvignon blanc and Semillon aren't exactly unusual in Napa, but the two Friulian cultivars are something akin to an albino alligator living in San Francisco Bay. Simply put, this is a tasty wine. The crisp fruit aromas are enticing. The unique blend yields complex flavors of cut grass, lemons, limes, white peach, guava, oyster shells and olive oil. This is a beautifully tart and refreshing wine. 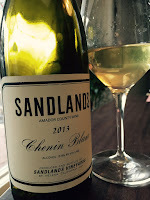 I opened this Sandlands 2013 Chenin Blanc Amador County (12.6% abv, Purchased $24) after having placed my order for the 2014 vintage. Luckily, I bought three bottles of this 2014. Unfortunately, I was only able to get one bottle of the 2014. After tasting this, I wish I had a case of both. This is an absolutely fabulous wine. This wine has a subtle nose at first, but with some time it opens up nicely. There are flavors of honey, tart green apple, honeysuckle, apple blossom, and some more honey. Add a little more honey. Despite the abundance of honey flavor, this is a dry wine. It is refreshing and crisp due to generous acidity. This is just way too drinkable. I don't think the bottle survived an hour. I Wish I could have bought more of the 2014s, but it will be fun to compare the three different renditions. I am happy to have two more bottles of this to enjoy in the future. Do yourself a favor, sign up to purchase these wines or find a friend who has bought them and convince them to open one in your presence.